/ e t c . & LiftGates PowerMate safely moves all your heavy loads. From hot water tanks and boilers to furnaces, A/C units and sewer machines, and much more while saving you money! 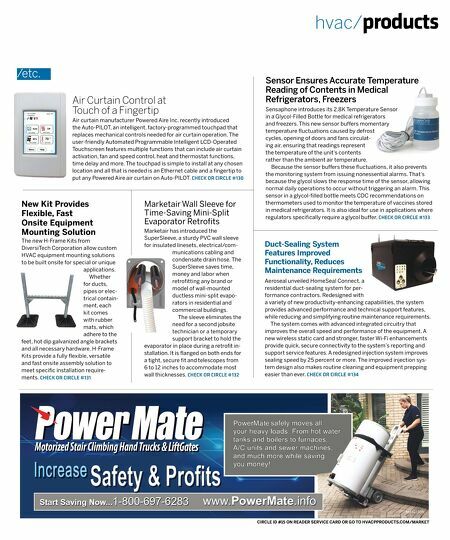 Start Saving Now...1-800-697-6283 www.PowerMate.info M3301801 CIRCLE ID #15 ON READER SERVICE CARD OR GO TO HVACPPRODUCTS.COM/MARKET hvac/ products Duct-Sealing System Features Improved Functionality, Reduces Maintenance Requirements Aeroseal unveiled HomeSeal Connect, a residential duct-sealing system for per- formance contractors. Redesigned with a variety of new productivity-enhancing capabilities, the system provides advanced performance and technical support features, while reducing and simplifying routine maintenance requirements. The system comes with advanced integrated circuitry that improves the overall speed and performance of the equipment. A new wireless static card and stronger, faster Wi-Fi enhancements provide quick, secure connectivity to the system's reporting and support service features. A redesigned injection system improves sealing speed by 25 percent or more. The improved injection sys- tem design also makes routine cleaning and equipment prepping easier than ever. 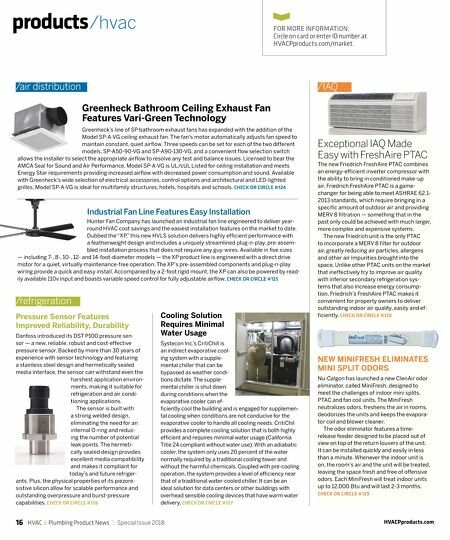 CHECK OR CIRCLE #134 Air Curtain Control at Touch of a Fingertip Air curtain manufacturer Powered Aire Inc. recently introduced the Auto-PILOT, an intelligent, factory-programmed touchpad that replaces mechanical controls needed for air curtain operation. The user-friendly Automated Programmable Intelligent LCD-Operated Touchscreen features multiple functions that can include air curtain activation, fan and speed control, heat and thermostat functions, time delay and more. The touchpad is simple to install at any chosen location and all that is needed is an Ethernet cable and a fingertip to put any Powered Aire air curtain on Auto-PILOT. CHECK OR CIRCLE #130 New Kit Provides Flexible, Fast Onsite Equipment Mounting Solution The new H-Frame Kits from DiversiTech Corporation allow custom HVAC equipment mounting solutions to be built onsite for special or unique applications. Whether for ducts, pipes or elec- trical contain- ment, each kit comes with rubber mats, which adhere to the feet, hot dip galvanized angle brackets and all necessary hardware. H-Frame Kits provide a fully flexible, versatile and fast onsite assembly solution to meet specific installation require- ments. CHECK OR CIRCLE #131 Marketair Wall Sleeve for Time-Saving Mini-Split Evaporator Retrofits Marketair has introduced the SuperSleeve, a sturdy PVC wall sleeve for insulated linesets, electrical/com- munications cabling and condensate drain hose. The SuperSleeve saves time, money and labor when retrofitting any brand or model of wall-mounted ductless mini-split evapo- rators in residential and commercial buildings. The sleeve eliminates the need for a second jobsite technician or a temporary support bracket to hold the evaporator in place during a retrofit in- stallation. It is flanged on both ends for a tight, secure fit and telescopes from 6 to 12 inches to accommodate most wall thicknesses. CHECK OR CIRCLE #132 Sensor Ensures Accurate Temperature Reading of Contents in Medical Refrigerators, Freezers Sensaphone introduces its 2.8K Temperature Sensor in a Glycol-Filled Bottle for medical refrigerators and freezers. This new sensor buffers momentary temperature fluctuations caused by defrost cycles, opening of doors and fans circulat- ing air, ensuring that readings represent the temperature of the unit's contents rather than the ambient air temperature. Because the sensor buffers these fluctuations, it also prevents the monitoring system from issuing nonessential alarms. That's because the glycol slows the response time of the sensor, allowing normal daily operations to occur without triggering an alarm. This sensor in a glycol-filled bottle meets CDC recommendations on thermometers used to monitor the temperature of vaccines stored in medical refrigerators. It is also ideal for use in applications where regulators specifically require a glycol buffer. CHECK OR CIRCLE #133 /etc.